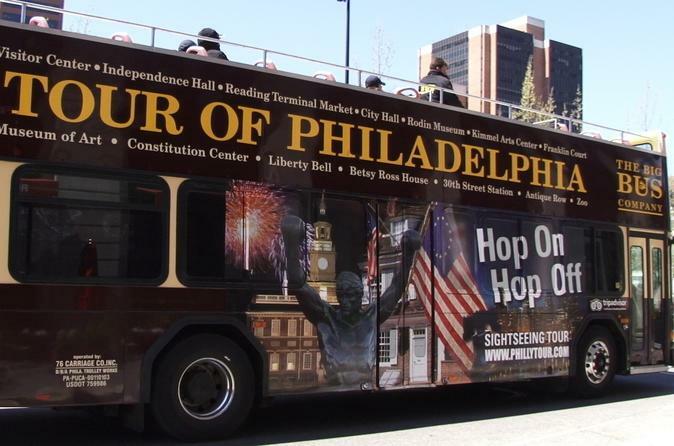 Explore all that Philadelphia has to offer aboard a double decker hop-on hop-off bus tour! Visit 27 top attractions, as an expert local guide offers live commentary. Popular stops include the Betsy Ross House, National Constitution Center, Liberty Bell, and Independence Hall. Hop on and off for 1 Day, 2 Days, or 3 Full Days! Discover one of the most historic cities in the U.S. on a hop-on hop-off sightseeing tour of Philadelphia. Experience the city's rich and legendary sights at your own pace, with 360-degree panoramic views. Board an open-top double decker bus at any of the 27 stops around Philadelphia. Along the way, enjoy live narration from your guide, who will share interesting stories and facts about the city's most popular attractions and historic landmarks. This hop-on hop-off sightseeing tour allows you customize your itinerary and experience the Philadelphia's history, heritage, and culture at your own pace.